For those of you whom have ever drawn a Colorado Sheep tag, you realize that this is where it all begins. My hunt started clear back in May after receiving the news that I had drawn. From there, it was a crash course in bowhunting sheep - learning everything I could before my hunt. I attended the Sheep and Goat orientation, met some other hunters and talked to the DOW for my unit (S12). I also utilized Bowsite.com's sheep conference, asking questions and meeting others whom had drawn tags and hunted the region. Next came scouting - getting familiar with my area. I spent nearly every summer weekend in driving, hiking, talking to folks, and most important; glassing for sheep. It was on one of these weekends that I met Gordon Roberts, a rifle sheep hunter who had waited 20 years for his sheep tag. Most weekends we scouted together, and on the odd weekend where one of us could not make it, we'd keep each other informed on what the other had learned. By opening weekend, I had a pretty good plan. On opening morning, my hunting partner, Mike, and myself, drove to the top of the pass only to find several other hunters who had drawn S12 tags. There was Dr. Mike, Phil and Tavis, Tim and Ken, Doug and Marv, and Ron, who has a cabin in the area. That made 7 out of the 10 tags. search of more stalkable rams. After a short time, we found out how good Bighorn eyesight really is. I was under the impression that they would be comfortable with a little movement, especially since they see hikers and cars all day long in the summer. But once you put on the camo, and get in that mode - the sheep sense your intentions. Dr. Mike got above the 9 rams and Mike and I tried to come from below. We were hoping Dr. Mike would spook them and they'd cross above us. If we spooked them, we were hoping they would spook and head upward past him. It was a game of patience that neither of us won. Around noon I decided I had enough of the sun baking me so I sat up and let them notice me. The rams grouped up, and then headed up the basin. It looked good for Dr. Mike (from our vantage point anyway) but later learned that they passed just out of range. Disappointed, but glad to get up and stretch, we decided to go up an over to see if we could find them on the other side. We caught up with Dr. Mike and discussed a the setup. There were some great views from the top, but no sheep. So we headed down to regroup back at camp. After dinner, Marv came by the camper to let us know there was a 3/4 in the basin below the pass. He and Doug would be coming up from the other side where the 9 rams disappeared earlier. After a brief discussion, we decided to go after him the next morning. I hit the alarm at 4:30 am. After a quick cup of coffee, Mike and I headed up the pass to look for the 3/4 ram. As the light grew, I spotted the ram in one of the grass chutes down in the basin. He was on the move as I followed him with my binoculars. As I did, more rams came into view. When I got back in the truck to warm up for a minute we had located 6 of the 9 rams from the day before. They were all in the rock cliffs. We grew confident. It looked like we were going to get an opportunity. We decided to flip for the first stalk and I won the toss. Just about then, here came some of the other hunters including Marv and Doug. 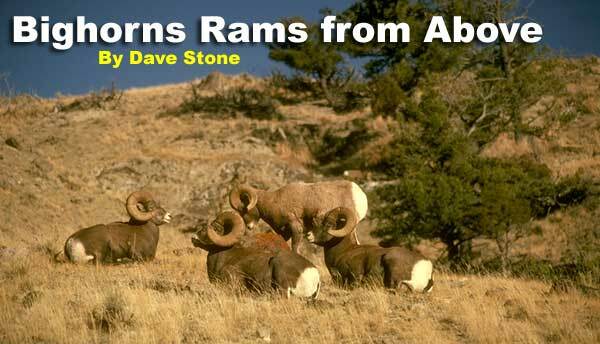 It appeared that the Rams had all moved into the basin and from down below Doug had located 8 of the 9. There was one ram that was content to stay up in the cliffs and look down over his domain. The other 5 rams looked like they were going to the west end of the basin. Marv suggested Mike and I position ourselves on the west rim and ambush them as they came by. This seemed like a good plan but just as were heading out, a group of 7 hikers spooked the rams out of the basin. We assembled again, and discussed the options with Marv. He simply turned and with a very deliberate look, told me “you need to go up the mountain an kill that one high ram” I said “OK” “how”? The ram had not bedded but he appeared content where he was. It was apparent that he was not going to join the other rams. I grabbed my bow and gear and headed up the pass to the west side to start my blind stalk. Marv and Tavis was going to flag me. I made my way up the hill to a rim above a snowfield. I was to drop over the edge and begin my stalk. It appeared to be a questionable approach from my new vantage point. With each step along the rock slide above the snow field, rocks began sliding underneath me. After traversing the treacherous terrain, I ease out over the rim, just above the highest snow patch. And I'm shaking in my boots. Tavis flags me that the ram has moved. I say a prayer of thanks as I ease back off the slide and onto more stable ground. Marv had assured me that he had made this stalk. All I can say is he must be part spider man. Having not regained my senses completely, Tavis was flagging me to go up and across, as the ram had moved and apparently was now bedded in a new location. My interpretation was that the stalk was called off and so I headed down. (somewhat relieved). My partner Mike drove to the top and started hiking up, he tried to flag me to turn around and go back up but I was content with my first interpretation. So down I came. At this point Mike continued up the hill. He had his bow so I begun to question what was going on. My head started to clear just as I was about 200 yards from Mike, and about 400 yards from the bottom. We could now yell back and forth. It seemed the ram had moved and was now bedded in a new location. I was to go back up the hill and Marv would flag me in. ( I remembered this to be the first plan as well) I contemplated the situation and wondered what again was in store for me as I attempted to come over the top of the rim. From my view there was no safe way to do this. Mike indicated that the ram was suppose to be near the top (something I would find out was another misunderstanding on my part) he also indicated that if I was coming down he was going up. This made up my mind and I made a 180 and headed up the mountain for the second time. However, this time it took me longer, go figure. That conditioning thing again. Well I got above the snow bank and looked over the edge to see Marv and Tavis leaning against the side of the truck. Again, the air is thin up there so what I presumed was them flagging me to come down at an angle was a mistake. The flags were laying on top of the truck and they were not flagging me at all, in fact they were waiting for me to appear above my location at the very top. I preceded to come down and around for another look. Same thing, down and to the right. I thought to myself, this is the same location as before. I had now come down about 100 precious yards and looked over the rim. Marv, away from the truck, was now flagging me and the message was loud and clear, UP and to my right as I was facing the mountain. Realizing that I had mistaken what I thought was them flagging me, I again trudged up the hill. This time I did not look over until I was on top. The signal came, move to my left, now facing down the mountain. Flagging is a very effective method of communication. It may seem easy to understand when you are both standing there together but put a 1/2 mile between you and it requires very deliberate and exact signals, which Marv has perfected in technique and materials. He uses fluorescent yellow and pink flags about 16 inches square and the hunter has a laminated 3x5 card with all the flagging symbols sketched with stick figures. What a great system. As I moved to the very top, the path narrows to just a game trail for about 50 to 75 yards. It appeared to be a drop off on both sides, I don’t know for sure because I didn’t look down. Once across, I came out over a very wide rock slide about 75 yards across. I continued down over the top slowly. I was under the assumption that the ram was somewhere near the top. I looked in every nook and cranny where the ram could be hiding. When I couldn’t see over any more I sat down and glassed Marv. I could not believe what I was being told. Marv dipped both flags 5 times between his legs (500 yards), and then a directional one flag straight down. I just sat there, dumfounded. I couldn’t see over the edge from where I sat, yet he wanted me to go 500 yards straight down? While I was confident that Marv was not going to send me to my death, I had to question my judgment. I got up and circled my position to look for a more manageable route over the top. I noticed Marv trying to get my attention with the flags. I couldn’t tell him straight down was not an option, so I maneuvered around and found a good way to descend. Each time I glassed down at Marv I got the reassuring deliberate signals that the ram was still below me and I was closing the distance. 400 yards, 300 yards, 200 yards, and then the magical signal I had been waiting for, 90 yards. I went into stealth mode, reaching out with my bow limb or hand and securing every rock that became dislodged under my feet. After 30 yards I stopped to check the flag. One flag dipped between the legs 9 times, 90 yards was the signal. "Hey, what's up with that? I am not standing still up here" I wondered. It appeared there was a miscalculation and I was heading over a large rock outcropping. I readjusted the route and made my way over the rocks, crab crawling and sliding down the cracks and crevasses. I closed the distance: 80 yards, 60 yards, now 40 yards. The ram was still below me. The adrenaline was pumping! I slowly eased out and over the cliff, peering into the nooks and crannies. Nothing. The signal came that the ram was still below me - to my left. That was a problem, steep rockslide to the left and deep 90-degree crevasse to the right. I opted for the crevasse. Marv was trying to get my attention to send me back up and around but I had already committed - I was going for the crevasse. Just below the bottom my right foot came to an abrupt stop on a large rock. I felt the rock come loose and I about got sick. I hooked my left heel under the rock and threw my bow above me. I then slid down until I grabbed a 2-foot rock. Despite the commotion, the ram did not spook and was just 30 yards below me. I climbed back up to get my bow. With both feet now on stable ground, I knocked an arrow as Marv dipped me 3 times. I surveyed the basin. I was just above an overhang. I moved to the edge and Marv dipped once. My heart was pounding out of my chest. The stalk was coming together. I peered over the edge and there he was. First his cream rump, then I could see the curl of his horn. The ram was bedded, and looking up, and back over his shoulder. I moved carefully so as not to spook him. I drew and leaned back out over the rim. I searched for that spot that would secure a vital hit, then released. The ram jumped up and ran to my left at about 30 yards, I nocked another arrow but it was not necessary. I sat down against the rocks in unbelief. It was Sunday, August 5th around 12:30 pm and I had just arrowed what appeared to be at least a 3/4 curl P&Y Bighorn Sheep! I looked at Marv through the binoculars, no more flag signals, I looked at the Ram who now had moved down nearly 200 yards and was wobbling on his feet. He sat down, then his head lay against the rocks. A few seconds later I heard the confirmation from Marv and Tavis that he had expired. What an incredible hunt! And I owe a lot to Marv's signaling which allowed me a 15 yard shot after coming over a 13,500 foot peak and down 500 yards to the ram. 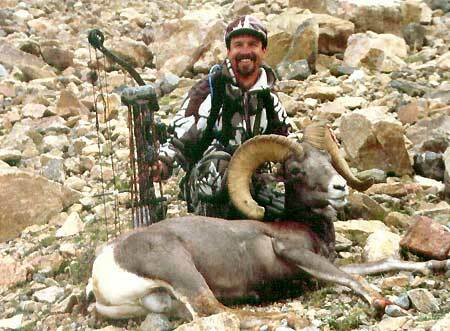 Bowhunting draws some real quality individuals, and it seems that sheep hunting elevates that. I met some real helpful individuals and quality folks and someday hope to return the favor. My ram is 7/8ths curl on the left side and a broomed 3/4 curl on the right. It appears that a bullet had hit his right horn from a steep downward angle. The bullet passed through the horn, taking out a chunk on the exit and missing his neck by inches. The ram was aged at 10 years old with 14 1/2 inch bases and 34 inch left side and 30 inch right side lengths. Some where in the 150’s - P&Y.